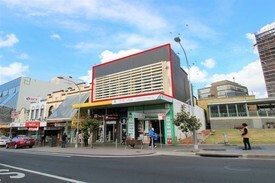 33 Commercial Real Estate & Properties in Hurstville are listed in 5 categories. We have 21 OfficesLease , 9 Retail ShopsLease , 1 Other Commercial PropertiesLease , 1 Industrial Warehouses Lease and 1 Development LandsLease . Gunning Real Estate is pleased to present this shop for lease. Situated right on the busy Forest Rd, the shop is only 90m from Westfield and 230m from Hurstville train station. Just underwent a full renovation, the property features a spacious open plan area and 1 partitioned room at the back, with full glass shop front on Forest Rd and side access from HSBC Arcade. KEY FEATURES: Internal area: 65sqm Brand new fitout Ducted air conditioned Common toilets Double shop access Excellent signage exposure CCTV surveillance Please contact William Wu 吴劭东 (0450 250 123) and James McKenny (0423 048 814) for details or inspection. All figures stated above are approximate. Gunning Real Estate is pleased to present this ground floor shop/office for lease. The property is conveniently located just 280m from Hurstville train station, 160m from Westfield, and 40m from a free Council car park. The property features an open plan layout with high ceiling. Own sink and common toilet are available. KEY FEATURES: Internal area: 61sqm Hurstville CBD location Air conditioning Own sink Common toilet Excellent signage exposure Suits many uses Please contact William Wu 吴劭东 (0450 250 123) for further info or inspection. Gunning Real Estate is pleased to present this affordable office/studio for lease. Located in a mixed use complex, the property is conveniently located just 150m from Hurstville train station, 70m from major bus interchange, 150m from Westfield, and 50m from public car park. The property features full glass frontage, an open plan area, a partitoned room, and its own kitchnette. KEY FEATURES: Floor area: 25sqm (approx.) Outgoings included in rental Ducted air conditioning Own kitchenette Common male&female toilets + disabled toilet Secure car space available at additional cost Abundant visitor parking + 3 hour Council car park nearby Lift + stairs + disabled ramp access Double building entrance Suits many businesses Please contact William Wu 吴劭东 (0450 250 123) for further information or inspection. All figures above are approximate. Gunning Real Estate is pleased to present this office located on the busy Forest Rd. The building is located right next to Hurstville train station, 35m from Hurstville bus interchange, and 130m from Westfield Hurstville. The property features a front reception area, 1 spacious open plan area, and 2 partitioned offices. Own toilet and kitchenette are available. KEY FEATURES: Internal area: 105sqm Ducted air conditioning Own toilet + kitchenette Excellent natural light In the heart of Hurstville CBD Existing office fitout Please contact William Wu 吴劭东 (0450 250 123) and William Gunning (0413 610 194) for details or inspection. All figures above are approximate. Gunning Real Estate is pleased to present this modern office for lease. Located inside a professional office building, the office is only 170m from Hurstville train station, 60m from Hurstville bus interchange, 200m from Westfield, and 150m from public car park. The office features a light filled open plan space and a private balcony. Common male&female toilets and kitchenette are avaiable. KEY FEATURES: Internal area: 64sqm plus balcony Secure basement parking available Ducted AC Common kitchenette + Male&female toilets Excellent natural light Dual lift access Well presented building 180 degree district view from balcony Disabled access Suits many uses Please contact William Wu 吴劭东 (0450 250 123) or William Gunning (0413 610 194) for details and inspection. All figures above are approximate. Excellent exposure Freestanding commercial premises Located opposite Hurstville Westfield Allocated off street parking Ducted air conditioning Internal amenities & kitchen/lunchroom Will suit a variety of professional uses Partitioned rooms Ground floor entry Close to Hurstville CBD and public transport Good passing trade Contact Damen Astey on 0431 817 616 or Carl Pearce on 0477 880 576 for more information or to arrange an inspection today! Gunning Real Estate is pleased to present this small and affordable office/shop on the 1st floor. The property is located opposite to the Westfield entrance, and only 80m from Hurstville train station. The property features a front reception area and 3 partitioned rooms (2 are windowed). Own kitchenette and common toilet are also available. KEY FEATURES: Internal area: 30sqm Air conditioned Excellent natural light Own kitchenette Access to common toilet Forest Rd signage exposure Please contact William Wu 吴劭东 (0450 250 123) for further info or inspection. All figures above are approximate. 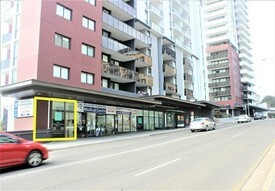 Commercial Property Group is excited to offer to the market the entire Level 1 of 2 Woodville Street. Perfectly positioned in the middle of Hurstville CBD and less than 300 metres to Hurstville train station, the building offers secure basement parking, lift access and open plan layout making it suitable to either sub divide for smaller tenancies or lease as your own private floor. Complete with own kitchen, male/female amenities and great natural light it will be sure to impress. Other Features include; 479m² total area. 7 secure car spaces Lift access Disabled ramp access Close to Hurstville train station. Own amenities and Kitchen. Great natural light + balcony. Option to subdivide Contact Damen Astey on 0431 817 616, Hayden Bennett on 0477 665 455 or Carl Pearce on 0477 880 576 for more information or to arrange an inspection today! 61m² ground floor office space on the corner of Forest Road and Botany Street one (1) secure car space Natural light Internal kitchenette Front reception, conference room + Open plan area Presentable common foyer in building with many other professional uses Common separate amenities, disabled amenities & disabled access Common shower facilities Suites professional uses Just move straight in! Contact Ryan McMahon (0429 228 460) or Carl Pearce on (0477 880 576) for more information or to arrange an inspection today. CPG the exclusive leasing agents are please to present this unique freestanding warehouse for lease, minutes from Hurstville CBD. Situated on the busy Forest Road, this warehouse conveniently provides side lane drive in access to 800m² of high clearance warehouse, making it ideal for bulky goods storage and a variety of other showroom uses. Other features include: Bonus covered loading area with side access Motorised roller door Renovated office and amenities Great signage to Forest Road Break room with kitchenette 3 Phase power The property is currently being used as a flooring and bathroom showroom, this property has had extensive renovation works completed to have a very modern and professional presentation. Contact Ryan McMahon 0429 228 460 or Carl Pearce 0477 880 576 for more information or to book an inspection today. Approx. Commercial Property Group are pleased to present this exciting opportunity to secure a brand new property on Forest Road as either a retail shop, food outlet or commercial office. Features include; 145m² floor space 3 secure basement car spaces Access to gas connection, exhaust connection and grease trap Easy access to male, female and disabled amenities Large glass facade providing great signage potential to Forest Road Next to Hurstville Highpoint Medical Centre NBN available Contact Ryan McMahon on 0429 228 460 or Hayden Bennett on 0477 665 455 for more information or to arrange an inspection today! Gunning Real Estate is pleased to present these two offices located on the busy Forest Rd. The building is located right next to Hurstville train station, 35m from Hurstville bus interchange, and 130m from Westfield Hurstville. The two offices can be leased separately or together. Suite 1: Internal area: 105 sqm Air conditioned (ducted) 1 front reception area, 2 partitioned rooms, 1 open plan area Own toilet + kitchenette Suite 2: Internal area: 95sqm Air conditioned (ducted) 1 spacious open plan area Own toilet Both offices would suit many business usage, and benefit from great natural light and Forest Rd signage potential. All figures above are approximate. Please contact William Wu 吴劭东 (0450 250 123) and William Gunning (0413 610 194) for details or inspection. Neighbouring Hurstville Highpoint Medical Centre, this 12.5m² consulting room/shop provides direct street exposure as well as internal access to the reception of the medical centre that includes a pathology practice and pharmacy. This property is ideal for: Consultancy room Physio Massage Cosmetics Any other Allied Health practice Features include; One secure undercover car space plus a shared customer parking lot Ready to occupy, save costs and time! Access to disabled amenities Internal sink & cabinetry Air conditioned Contact Ryan McMahon on 0429 228 460 or Hayden Bennett on 0477 665 455 for more information or to arrange an inspection today! Located on Forest Road surrounded by landmark tenants such as Bing Lee, Nutrition warehouse, Apple ideal store and Anytime Fitness, this Office includes: 4 basement allocated car spaces with a customer carpark Ducted air conditioning Three partitioned rooms including a reception, meeting room and open plan workspace Great natural light Well maintained building with CCTV security Swipe card access Great exposure & signage opportunity to Forest Road Male & Female amenities. Contact Ryan McMahon (0429 228 460) or Mitch Brown (0429 122 460) for more information or to book an inspection today. Three (3) level commercial terrace suitable for office or medical/consulting use. GROUND FLOOR: Reception and waiting area with back of office and kitchen and bathroom amenities. 1st FLOOR: Two (2) partitioned offices, meeting area and kitchen and bathroom amenities with balcony. 2nd FLOOR: Two (2) partitioned offices. Situated within a well established and popular "u shaped" business center comprising 14 units, the center is excellently located just 100 metres to the Hurstville bus interchange and station entrance and close proximity to Westfield Shopping Centre. FEATURES 136sqm over three (3) inter connected levels Two (2) tandem car spaces Air conditioned Access via the ground and 1st floor public terrace Flexibility to be split into two separate suites For more information or to inspect the property, please contact William Wu 吴劭东 (0450 250 123) and William Gunning (0413 610 194). Gunning Real Estate is pleased to present this Retail/Commercial opportunity for lease on the ground floor of the Hurstville Highpoint development. The property is located next to a medical centre, with a bus stop right in front. The property features full glass frontage, high ceiling and a sink. KEY FEATURES: Floor area: 13sqm (approx.) One(1) secure car space No need to pay electricity and water Ducted AC Modern fitout Common toilets Suits many business usage Walking distance to train station 448 residential units above Please contact William Wu 吴劭东 (0450 250 123) for more information or to inspect the property. Gunning Real Estate is pleased to present this modern office space for lease. Located in Seaview Business Centre, the office is within walking distance from Allawah and Hurstville train stations, and is surrounded by 4 schools. The property features a furnished windowed office, an open area with four work stations, and a common board room. Common kitchenette and toilet facilities are also available. KEY FEATURES: Two car spaces (Tandem) Access to common board room and balcony Great natural light Air conditioned Common kitchenette + Male, female & disabled toilet Lunch room Please contact William Wu 吴劭东 (0450 250 123) for further information or inspection. Affordable parking Located in Hurstville CBD Opposite Hurstville Westfields Basement security spaces 3 x spaces available Contact Ryan McMahon (0429 228 460) or Carl Pearce (0477 880 576) for more information.